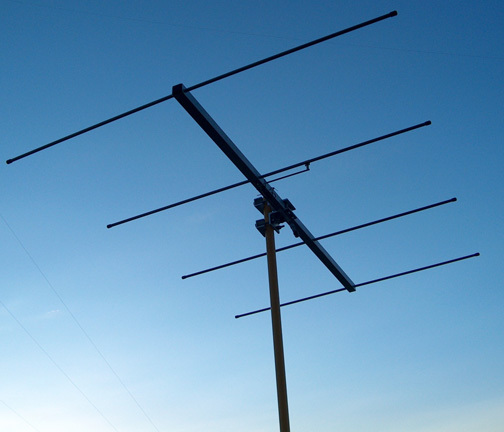 YOUR OWN TWO METER YAGI - WHERE TO START! A step by step instruction on the creation of a four element, horizontally polarized, two meter Yagi you can build yourself. Make your association with the Rocky Mountain VHF+ Net a bold new and rewarding experience. First off why do we want a four element horizontally polarized yagi rather than a two or three element, just a dipole or something vertical? Horizontal polarization is the tried and true polarization of the weak signal community. Horizontal polarization experiences less manmade noise than vertical polarization. The lower portions of the VHF/UHF bands in the spectrum above 28 MHz (10 Meters) is referred to as "weak signal spectrum". At 6 meters and above it is advantageous to have some gain (directivity) and front to back ratio (F/B) in an antenna system. The F/B is relative power from the front to the back of the antenna measured from a fixed distance. This antenna will produce ~10:1 ratio. Directivity referencing a dipole or an isotropic source - is known as gain. Gain is a measure of directivity in dB or how much relative power you are putting in one direction or how much better you can hear signals in one direction than in another. A four element Yagi antenna will effectively quadruple your power in one direction over a dipole. This is 6 dB gain of directivity over a dipole and 8.14 dB over an isotropic source. A dipole has a gain of 2.14 dB over an isotropic source. It radiates/receives in two directions with a beam width of ~159 degrees at the -3dB points in both directions. Off the ends of a dipole there is a null. A rotate-able dipole is of some use in some cases. A two element Yagi is somewhat better than a dipole as it has 3 dB greater directivity (5.14 dBi gain) and provides a beam width of 112 degrees at the -3dB points in one direction. Still not much gain (directivity) and not much in the way of front to back ratio. A four element yagi sporting 6 dB gain over a dipole will produce a beam width on the order of 80 degrees, that's less that a quadrant of the compass. This is +/-40 degrees of bore sight. Another reason for four elements is the fact that in mounting the antenna, the mast will not be near the driven element or the matching network. This makes the boom to mast plate easier to create and employ. The materials suggested here will make the Yagi rather robust against the elements, bird strikes or just plain mishandling - such as dropping it off the roof or tower (if you're so inclined!). Booms are generally made of either round or square aluminum tube, aluminum tubing or sometimes even wood. By convention aluminum tube referred to here is the rigid lengths of material with at least a 0.058" wall thickness as compared to tubing, the stuff in rolls. Start the four element Yagi antenna construction with a 48" length of 1" square tube available from most hardware emporiums (Lowe's, Home Depot, etc...) Round tube is difficult to drill and get the elements straight, as all in the same plane. Begin by measuring one half inch from each end of the square boom material and mark that point in the center of the side with a punch. One of these marked points is for the Reflector element at the rear of the yagi and the other at the front is for the second Director element. The distance between these two marked points is 47". Three equal distances between the Reflector and second Director are 15-2/3" (not real critical). Make a mark 15-2/3" from the Reflector mark and another mark 15-2/3" from the second Director mark. These marks are for the first Director towards the front and the Driven element towards the rear. Drill the four places that have been marked with a drill bit that is the diameter of the material chosen for the elements, in this case 5/16" diameter tube. Drill these holes through both walls of the boom. Now, rotate the boom 90 degrees and mark the boom at four places in the same location that was previously marked for the elements. Drill these a little larger than a #6 hole using a #26 drill bit (0.147" Diameter). Drill only through the wall of the boom that was punched in the first, third and fourth position. At the second position drill through both top and bottom walls of the boom. A screw holding the Driven Element in place will protrude out the bottom of the boom and be used as a connection point for the braid/shield of the transmission line (coax) used. Elements can also be made of aluminum tube, tubing or even rod. For this project I selected some 5/16" diameter aluminum tube (hollow rod) due to its availability, strength and light weight. Approximately 13 feet of element stock will be required. Build the Reflector first, make it 40" long. Find the middle of the length, drill and tap a hole for a 6-32 screw. The Driven Element will be ~5% shorter than the Reflector or 38" long. Again, find the center of the length, drill and tap a hole for a 6-32 screw. Next the First and Second Directors can be made the same length. These will be ~3% shorter than the Driven Element or 36.75" long. These should be drilled and tapped the same as the other two elements. The elements can now be inserted into the boom. Remember the Driven Element is to be placed in the second hole from the end at the location where both top and bottom walls have been drilled through. The elements will be held in place with 6-32 X 3/4" screws (Button Head Phillips, Pan Head or Round Head Slot) except the Driven Element screw which will be a 6-32 X 1-1/4" screw, fitted with a lock washer and nut. Next the matching device is to be assembled. The configuration of this Yagi antenna is known as a "Plumber's Delight" (everything is connected together and grounded), a Gamma Match will be the simplest to construct. The Gamma Tube is usually ~10% of the length of the Driven Element, in this case it will be 5" long and made from a length of 0.155" diameter brass hobby tubing. This 5" length of material will be attached to the Driven Element with a strap of brass shim stock so it hangs down approximately an inch (center to center) below the Driven Element and off to one side of the boom allowing the free end to be positioned close to the boom but not touching it. Take a short length (~3') of RG-58 and remove about 6" of the outer cover. Cut off 5" of braid. The remaining inch of braid is to be unbraided, twisted into a single conductor and soldered to a "ring or eye terminal" that will fit snugly on the 6-32 screw that has the lock washer and nut. Fit the insulated center conductor all the way into the 5" length of material that has been attached to the Driven Element. The "ring terminal" on the twisted braid will match up with the 6-32 X 1-1/4" screw that is now protruding from the bottom of the boom. A couple of nylon ties around the boom and RG-58 transmission line will keep the transmission line/Gamma Match assembly from swiveling. The bitter end of this short length of transmission line can be fitted with a coaxial connector of your choice. Set the antenna aside for now. The tune up procedure, if even needed, will be addressed later. Make a 4" X 4" X 1/8" plate of aluminum for your boom to mast plate. Mount four appropriate size "U" bolts and saddles on the four edges of the plate. Mount the boom to mast plate at the center of the boom. Make the elements horizontal and attach the assembly to a mast 5 or so feet above ground.